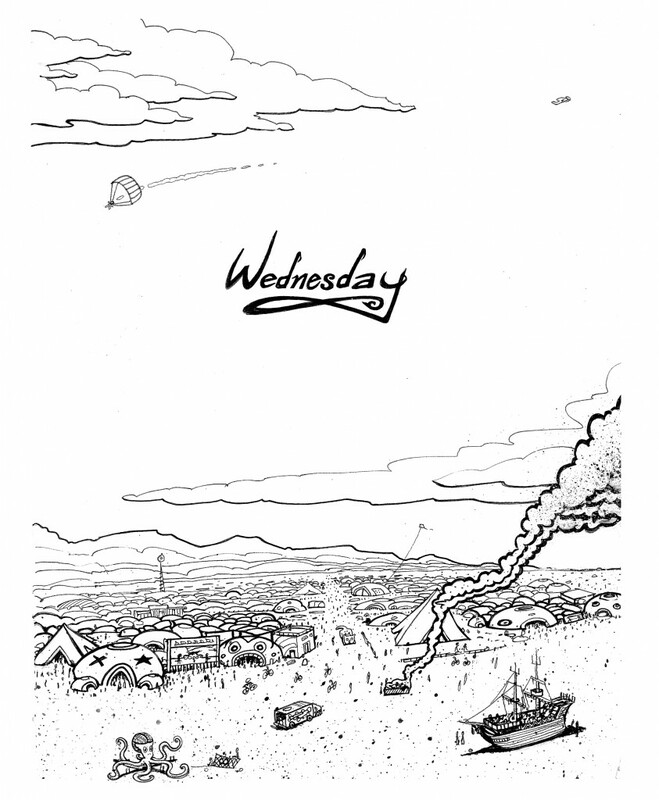 A webcomic for Black Rock City. Thanks for following the ongoing adventures of Drink Water! Those of you who remember the print version of Drink Water! released back in 2008 might recognize this image, this was the opening scene for that issue which told the story of a hot and dusty Wednesday on the playa. That print comic will provide the basic outline for some of our upcoming adventures. Which means that you can look forward to a mud-wrestling match, battling dragons, a Thunderdome fight, and a stilt soccer rematch in the pages to come. Thanks again for reading Drink Water! And stay tuned! There’s a lot more to come!
. . . )'( . . .